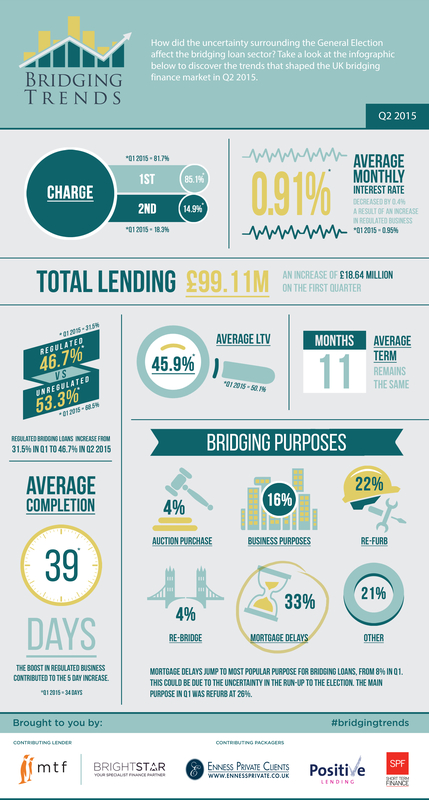 Take a look at the infographic below to see the trends that shaped the bridging finance market in Q2 2015. The latest data is interesting and suggests that the short term lending market is regularly shifting. Bridging Trends, which offers a general snapshot of the market, is still however at an embryonic stage and we will need to collate more data over several quarters before we can confidently look to identify any emerging or consistent trends. The overall trends are reflective of those experienced by Enness since the Q1 report. Although the overall LTV continues to surprise me. I thought the industry as a whole would have been much higher. Pricing is still under downward pressure from strong competition, but how much lower can this go? The average completion time also killing the myth once touted that “If it’s not done in 2 weeks it’s just not bridging! However, I guess the big news is that lending volumes are up markedly. We have experienced this in the market overall (not just bridging) and it was definitely a post-election thing from our perspective. We had lots of clients (and indeed lenders) sitting on their hands until after the election with fears about property taxes, caps on rent increases etc. The residential mortgage team at Enness has also seen an increase in volumes for the same reasons, and will confirm that the residential mortgage lenders are struggling with the demand and struggling to turn things around in time. I think Bridging Trends data directly reflects just that- mortgage delays were at 8% in Q1 and jumped to a massive 33% in Q2. The question is, has this just been a post-election spike? Or something that will carry momentum for the rest of the year? It comes as no surprise to us that the specialist lending sector continues to grow, competition is hot between lenders which is great news for the consumer. Many of the lending scenarios we see every day are relatively straightforward, are for valid reasons and have viable exit strategies. All the while the high street lenders remain uninterested in these transactions the further the specialist sector will cement its reputation as a viable alternative for the consumer. It is really pleasing to see lending up by almost £20m for Q2 Vs. Q1, which indicates the bridging sector is still in very rude health and there is continued demand for bridging finance as the sector continues to grow. The real stand-out stat for me this month is the average deal time of 39 days to complete a loan, up from 34 days in Q1.For me this is as a direct result of delays with surveyors (trying to keep up with demand) and legals. Those lenders, who can deliver quickly and with minimal fuss, are those best fit to take market-share. It’s not all about rate. The key-driving factor has historically been speed and 39 days to complete a bridging loan is not a stat I am particularly proud of. As an industry, we can and should do better.